Colloidal Silver Secrets: Is It Really Necessary to Store Colloidal Silver in Dark Glass Bottles? Is It Really Necessary to Store Colloidal Silver in Dark Glass Bottles? Most experts recommend storing your homemade colloidal silver in dark glass bottles for long-term storage. That’s because the dark glass keeps the light out, preventing the light from “tarnishing” (i.e., oxidizing) the silver particles suspended in your colloidal silver solution, which in turn lead to the silver particles falling out of suspension and coating the bottom of your storage container. 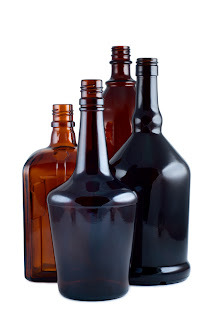 If you’re a “prepper” and you’re planning on making and storing colloidal silver for the long-term, it’s important to know that just about all experts recommend storing colloidal silver in dark glass bottles, such as amber glass bottles (pictured above) or even cobalt blue bottles. While the dark amber or cobalt blue storage bottles are the most popular, just about any dark-colored glass jar will work. I’ve used empty wine bottles, for example. Some people use empty beer bottles. I’ve seen people use empty Ovaltine jars. If you don’t have a lid to cover your dark-colored bottle or jar, you can always use some Saran Wrap and secure it around the top of the glass container with a rubber band. Or, you can purchase amber glass or cobalt blue glass storage bottles with plastic lids through some of the online vendors I've listed in my previous article, Online Sources for Glass Containers for Making, Storing and Using Colloidal Silver. Some of these companies even have dark glass pump spray bottles and nasal spray bottles in a variety of sizes, as well as dark glass bottles with ear droppers! But frankly, if you don’t want to spend the money on dark glass storage containers, all you have to do is wrap some black electrical tape around a clear glass jar, such as a Ball canning jar or a Mason jar. And voila! You’ve got a dark glass storage container. Those methods are fine. However, I’ve found that it’s much easier to take a child's brown paper lunch sack and place your clear glass jar full of colloidal silver inside the paper sack. Then, simply put the paper sack inside a dark cabinet. It works just as well as using a dark glass storage jar! The general idea of using dark glass bottles for storing colloidal silver is to keep bright light off the tiny silver particles that are suspended in your solution. After all, silver tends to "tarnish" (i.e., oxidize) when it's exposed to bright light for a prolonged period of time. And once the tiny, microscopic silver particles in your colloidal silver solution begin oxidizing from excessive exposure to light, they lose their electrical charge, and then precipitate out of suspension, coating the bottom of the storage bottle. But brief, short-term exposure to light generally doesn’t cause the silver particles to oxidize. It’s long-term excessive daily exposure to bright light that causes the problem. For example, sitting a clear glass jar full of colloidal silver out on a well-lit kitchen countertop day-after-day will most certainly expose the silver to too much light, and ultimately the silver particles will begin to precipitate out of suspension and coat the bottom of the container. That’s why commercial bottled brands of colloidal silver you buy at the health food store almost always come in dark glass bottles. It’s to keep bright light out and thereby prevent precipitation of the silver particles, and concurrent loss of potency. But you have to keep in mind that the bottles of colloidal silver sitting on the shelf in a health food store are being exposed to bright light most of the day. So dark glass bottles must be utilized, to help protect the colloidal silver solution from excessive light exposure. Is Dark Glass Really Necessary? Can Clear Glass Be Used? This may not be the case at all, however, when you’re storing your homemade colloidal silver at home -- particularly if can store your colloidal silver solution in a dark cabinet that’s rarely opened. In a dark cabinet that’s rarely opened, your colloidal silver solution simply won’t be exposed to bright light for prolonged periods of time. So while dark glass bottles are highly recommended, they’re not absolutely necessary. If you can keep bright light away from your stored bottles of colloidal silver, you can indeed store them in clear glass containers for many months at a time, even up to a year or more. I’ve done so on many occasions. In fact, nowadays after I make a batch of colloidal silver in a one-quart clear glass Ball canning jar or Mason jar, I don’t even bother to pour it into a separate dark glass storage container any longer. I just put the lid on the clear glass production jar, and pop it into the dark cabinet that sits high above our kitchen stove, which nobody gets into but me due to its height. Indeed, at any one point in time I have over a dozen completely clear, quart-size clear glass jars (i.e., canning jars) of colloidal silver stored in that dark cabinet above my kitchen stove, and they've been there for many months, and are just fine. This works perfectly for me, and I’ve never had a problem with a batch of colloidal silver “going bad” before its time. Or Will Plastic Bottles Work? Glass jars are generally recommended for long-term storage of colloidal silver because cheap plastic jars tend to accumulate static electricity over time, particularly in the winter months. And the static electricity on the plastic storage bottle can end up drawing the silver particles in your colloidal silver solution to the sides and bottom of the plastic jar where they’ll “stick” and begin to coat the plastic. This can dramatically deplete the potency and effectiveness of your stored colloidal silver solution. However, since last year I’ve been experimenting with storing colloidal silver in high-quality, BPA-free plastic beverage carafes with sturdy plastic lids and pour spouts like the one pictured on the left. And they’ve been working wonderfully! In fact, I haven’t had a single problem with static electricity (or anything else, for that matter) affecting the potency or quality of the colloidal silver stored in these wonderful little plastic beverage carafes. 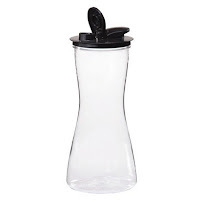 And since each carafe comes with a plastic lid that includes a handy pour spout, and closeable plastic flap, they’re extremely convenient for pouring colloidal silver. As an experiment, I’ve purposely brewed up several batches of very high potency colloidal silver – up to 50 ppm -- and stored these solutions in these clear plastic beverage carafes for up to eight months in my kitchen and bathroom cabinets, and have not seen any precipitation whatsoever of the silver particles. Admittedly, the beverage carafes are a bit pricey, around the $10 apiece range. But the high quality of the plastic, and the convenience of the carafe style with a pour-spout lid makes the extra money worth it, to me. I now keep a one-quart clear plastic carafe full of colloidal silver stored in the dark cabinet under my bathroom sink, which I use to refill the little 8-oz. amber glass pump spray bottle and 2-ounce amber glass nasal spray bottle I keep on my bathroom counterop. 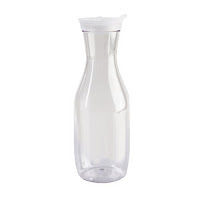 I also keep one of these clear plastic carafe’s full of colloidal silver in a dark cabinet in the kitchen, which my wife Kathy and I use to fill our little shot glass with colloidal silver each morning for our daily maintenance dosage. These clear BPA-free plastic beverage carafes are just plain handy, particularly because of the pour spout and closeable flap. However, for my truly long-term preparedness colloidal silver storage, I do still use the clear glass Ball canning jars or Mason jars, and keep them in a dark cabinet as described earlier. The BPA-free plastic carafes are often available at Walmart. And sometimes you can find them at specialty stores like Bed, Bath & Beyond. You just have to shop around until you find one. Make sure it says BPA-free right on the label. And make sure it has the handy pour spout lid with a closeable flap. At Bed, Bath & Beyond I’ve found them in the one-quart size. And at Walmart I’ve found a completely different brand (Tritan) in the larger 60 ounce size. I’m told that Sears has a similar clear glass storage carafe with lid, but I don’t know if it’s BPA-free. And I’m told Rubbermaid makes an even larger one-half gallon BPA-free plastic storage carafe, which is often sold online at Target.com for about $10.00. So if you’re experimental-minded like me, you might try storing a few quarts of your homemade colloidal silver in clear glass jars, making sure to keep them in a dark cabinet that’s not opened very often. Then, simply check them once every month or two for precipitation of the silver particles. And if you like the idea of using the clear, BPA-free plastic beverage carafes like those I’ve described, you can give them a try also. I’ve found the beverage carafes to be great for under-the- counter storage in the kitchen or bathroom, where you might use them to refill your smaller containers of colloidal silver from time-to-time, such as pump spray bottles or nasal spray bottles. Naturally, if you see precipitation of your silver particles taking place when storing your homemade colloidal silver solutions in clear containers – whether plastic or glass -- then I'd definitely recommend switching back to using dark glass storage containers. Obviously, the precipitated silver would mean someone is getting into your cabinets or leaving the doors open more often than you might realize, and exposing your stored colloidal silver to excessive levels of light. But from what I’ve discovered over the past year or so about storing homemade colloidal silver in clear glass containers, as well as in the high-quality, BPA-free plastic beverage carafes, this is rarely a problem as long as you store your containers in a dark cabinet where exposure to light is strictly limited.